Wait — Is Times Square Suddenly a Good Restaurant Neighborhood?In a shocking twist, New York’s most derided neighborhood has seen an infusion of, uh, good places to eat and drink. Viral Reddit Post Asks People to Justify Eating at the Times Square Olive GardenThe post is at 11,000 comments and counting. A 3-Alarm Fire Broke Out at a Times Square Restaurant This MorningThere were 140 firefighters on the scene this morning. The Señor Frog’s in Times Square Is ClosedThe margarita-fueled party spot is a goner. Taste-Testing the New Kellogg’s Cereal CaféCritic Adam Platt and Grub’s Sierra Tishgart try the chef-driven bowls. Girls Attack McDonald’s Worker for Shushing ThemNYPD says his request got a 17-year-old fist to the face. 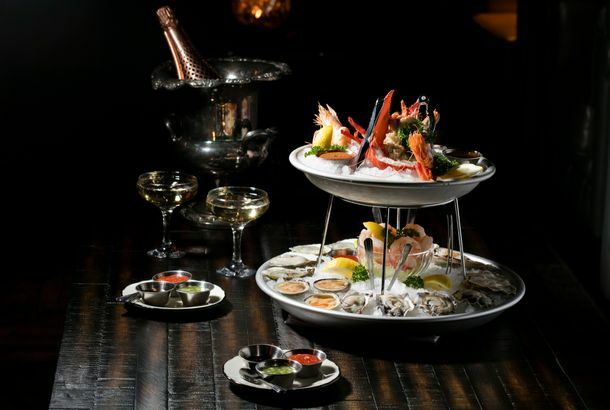 Times Square on NYE Gets Even WorseDinner at Ruby Tuesday costs up to $1,699. City Kitchen Is the Massive New Food Hall That Times Square Has Been Waiting ForVendors include Luke’s Lobster, Dough, and Azuki Sushi — and it opens this Thursday. Wings, Beer, Spoodles: How a Buffalo Wild Wings Preps for Super Bowl Sunday40,000 wings, a couple hundred gallons of sauce, 100 more gallons of blue cheese and ranch, and a thing that’s not quite a spoon, not quite a ladle. The End of Café Edison, Times Square’s Last Real RestaurantThe beloved Theater District diner will close at the end of the year. Lucky Cheng’s Lives On As a Cabaret Pop-upIt’s now a three-course dinner and a show. Original Bowlmor Lanes Closes TodayThe bowling alley attracted movie stars and models in the 1980s. Original Bowlmor Lanes Faces Demolition to Make Room for Incoming CondosWe’re still hoping for a spare, however. Yotel Moves to Shut Down Its Times Square RestaurantsNo matter what happens, brunch at the hotel will go on. What the World Needs Now Is a Really Big McDonald’sThey do sell McSpaghetti in the Philippines. 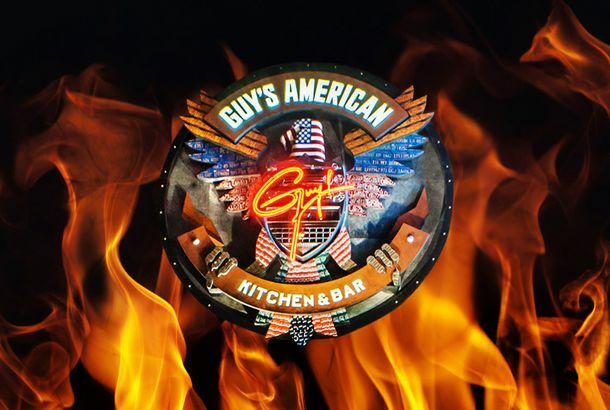 See the Menu for Guy’s American Kitchen, Dude!Guy Fieri’s massive Times Square feeding trough opens Sunday — see the menu! Peep World Becoming Nice, Wholesome HootersIt dodged the d-bag-bar bullet. NYC Says Whassup WasabiLondon sushi crosses the pond. Guy Fieri Opening Gigantic NYC Restaurant in Times SquareIt’ll be in Times Square, obviously. Will Bright Lights Revive Restaurant Row?Or will it take much more? Nuchas Empanadas Opens Tomorrow in Times SquareAnother of the four promised food kiosks debuts. Salumè, Rickshaw Dumpling Bar, and Others Headed to Times SquareThe winning bids for those concession stands have been announced. ‘High-end Caribbean’ Chef Needed in Times SquareA new restaurant is looking for a chef to serve small plates in a big space. E & E Grill House Wants to Make Steak and Potatoes More User-FriendlyBy making everything more affordable! Downtown Crossing: Like Times Square, Only Different?Critics offer up suggestions for the neighborhood’s survival and revival. First Look at Paramount Bar, Bringing a Female-centric D.J. Lineup to TimesThe decor may be throwback, but the music program is progressive. Greenpoint Loses Night Bazaar While Times Square May Gain Alfresco Food ServicePlus: The Aqueduct Racetrack flea market (with its empanada truck and more) may relocate to Coney. A Vodka Comeback? Nobody Told Rum House’s Bloody Mary MenuBut Fort Defiance is doing a drink with Port Chester honey vodka. Sunday Smorgasbord Now at Aquavit; Brooklyn Brewery Feast at MexiQPlus more, in our daily roundup of neighborhood food news. First Look at the New Rum House, Pouring Cocktails on MondayThe Times Square classic makes a return, this time with original libations. Uh, We’re Going to Have to Lift That Ban on the Rum House’sThe nice guys behind casual cocktail den Ward III have taken over the space. Soledad O’Brien’s Favorite Sandwich Comes to MidtownPiccolo Café opens its second location. IHOP Announces New York–Area Expansion, Starting With Times Square24 new locations in the next years. Doughnut Plant Doughnuts in Midtown, Care of Oren’s Daily RoastAnd Balthazar pastries as well.